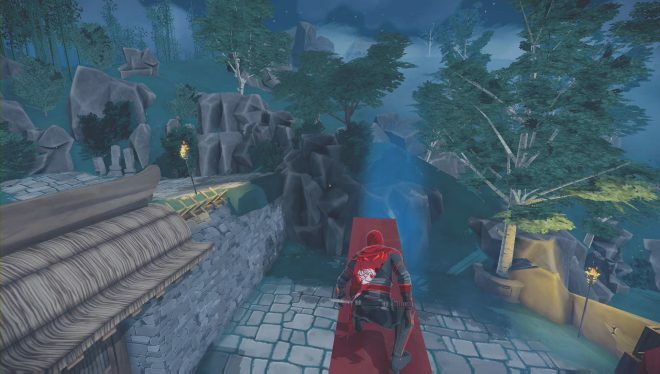 Aragami is a stealth game that takes a different approach to the genre. You play as Aragami, an undead spirit who is summoned by a girl (Yamiko) that wants you to free her and her empress. You will be facing the Kaiho army. There are a few plot elements I won’t reveal, but just know that you’re a ninja with powers of the dark and you will be killing a lot of people within the shadows (or avoiding them entirely if you so choose). The game offers cooperative play online, though you’ll likely have to find someone, as matchmaking is empty most of the time. 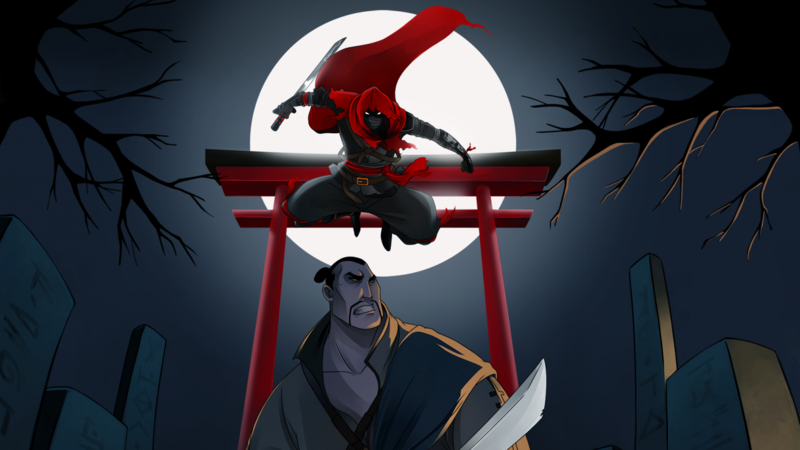 Art Style: Aragami features a unique mix of cel shaded painting. It can be described as beautiful and is something you will instantly appreciate. 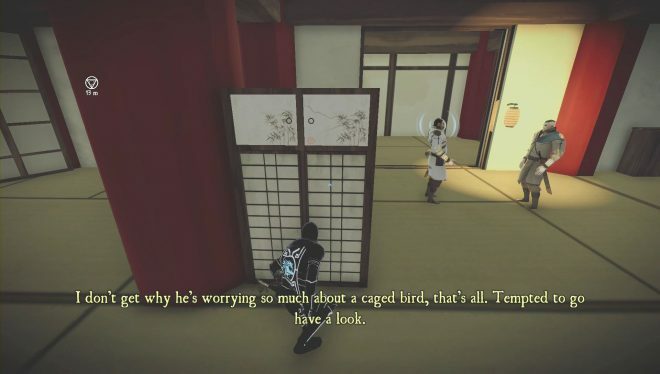 The character model is one of the best looking ninjas you will see, with a cloak that serves are your HUD. However, the fascination will end as quick as your first stealth kill. Repetitive environments of trees, caves, and structures will soon feel uninspiring. It’s like looking at a cute animal, but then scrolling through another 20 pictures of it in the same pose. However, when you play the extra content Nightfall, you will enjoy new settings and environments. Luckily the game also graces us with skins to unlock that look very different from your starting outfit, and are some excellent choices in design. Music/Sound: Created by Two Feathers, the music channels an ancient orchestra. The sound effects are done well and add to the atmosphere. There are a few hiccups while assassinating enemies, but that can be overlooked and forgiven. Music is absent from the main menu screen, which is a little disappointing. Also you may experience a glitch where you can’t hear sound, and you must force close the game to get it back. Hopefully they fix this. Upgrade System/Techniques: To get upgrades, you must find scrolls hidden throughout the levels. Make sure to grab the upgrade to reveal all scrolls on the maps as soon as possible. When you collect a scroll, even if you die, it will still be saved as collected. This makes it a breeze to try out different powers every chapter. The abilities will carry over when you play on the various difficulty settings, which is a major plus for replaying. 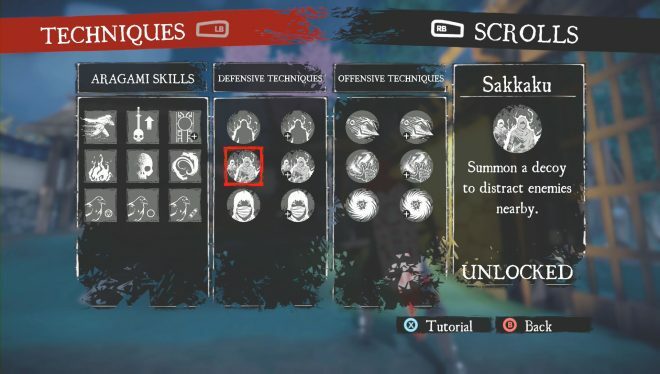 Once unlocked, powers will have a tutorial you can read. It might have been a better choice to let you read the tutorial before committing your scrolls, but this doesn’t prove too much of a problem because you will be upgrading all powers eventually. It would have been great if there was a different button mapped for stealth non lethal based powers, but the game went with a much heavier kill based system. There is only one real “buff” to your character, which is a 25 percent increase to Shadow Essence recovery rate. Stealth implementation: While it’s nice to see a mix of Tenchu with hints of Dishonored, the game falls short of perfecting the feeling of control. The shadows are not dark enough, and deeply hinder the experience. There is sort of a clunky feeling to the Shadow Leap technique. You will sometimes get stuck in areas because there is no darkness close by to refresh your power. This didn’t happen often, but enough to be annoying. While some may argue it makes the game more difficult or interesting, it really doesn’t. It causes a constant annoyance of searching for a shadow and waiting to refill. Aiming the leap sometimes makes little sense when the game randomly decides to let or decline you access to an area. There were several occasions I would aim up somewhere, and basically move the cursor around trying to get the icon showing that I will climb something instead of hitting my head on the ceiling (why this is an option in the first place is a mystery). While some areas will feel consistent and you can teleport around nicely, there are too many that leave you feeling like a rookie ninja. When you kill someone, you always sheath your blade and you do it very slowly. It isn’t upsetting that it adds a delay for nearby enemies to discover you, it’s upsetting because it’s boring having to wait every single stealth kill. You also get a skill early on that lets you consume the bodies into darkness (make them vanish). So they are kind of double dipping with detection here. A guard walking in your direction and you have to put your blade away after a kill, then also make his body disappear. I believe they could have had that covered with the body alone. If you don’t make the body vanish it will be discovered, if you Shadow Vanish it, you have split seconds to get out of there. Enemies: The members of the army you’re facing in Aragami look like clones. They seem copy and pasted all around the levels. While being patient and watching patterns of movement are implemented decently, there comes times when you get to a few enemies who decide to have a nice long chat. They repeat this a number of times throughout the game and you usually have to wait for them to stop talking before you can set out to plunge your blade into them. There is no way to double assassinate them from above, and you’ll soon almost fall asleep to their stories. There are only a few different types of enemies. They either have a bow or a sword. Usually a game will progress with new kinds of enemies, but here you will just kill the same people over and over again. There are two boss type battles in the game, and I will admit it was a nice break from the rest of the game. Interface: First off, the pause menu is awful. It’s set at a slant and almost causes vertigo. 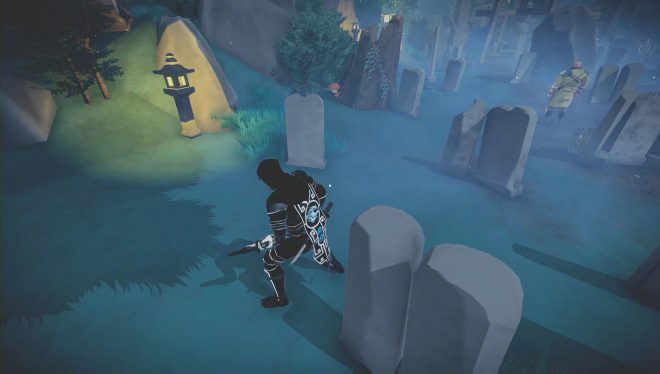 While at first the cape having a HUD on it seems to help with screen clutter, it also manages to make it difficult to know you’re out of power for shadow leaping. Whiling closing the distance to an enemy, it’s almost a nuisance to constantly check your back. 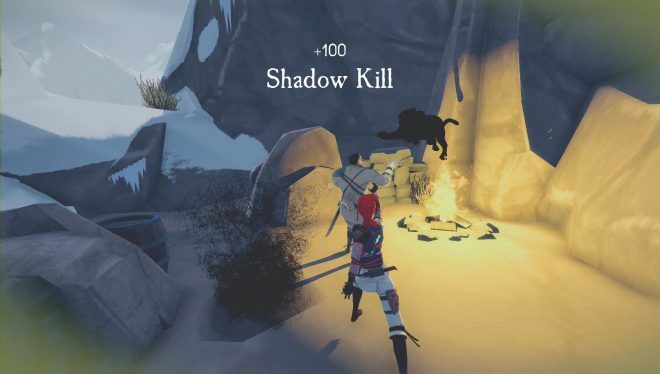 Using the ability to throw a shadow onto something uses so much Shadow Essence that you will have to seek the shadows more often than you’d like. The cape sometimes will fold behind your sheathed sword. This impairs your view for half of your cape! How this made it through any testing is beyond me. You have to rotate your character around trying to swing the cape back to full view. However, again, the Nightfall expansion fixes this by giving you a better HUD system on the characters back. An option to play the other two characters in the main game should have been implemented. There is another weird quirk to the game – if you leave the game on without moving, you’re punished with being kicked back to the main menu. Even though you really weren’t idle for very long, the game just restarts. While Aragami will be enjoyable, it will start to get dull as you kill enemies (like a blade does). It almost feels like a Batman game where you’re just doing the stealth challenge missions. While it does what it does fine, it feels lacking as an entire game. It has replay value in the form of medals and achievements. The medals are not something you look forward to going back to, and you’ll often find yourself just running through the levels to get the game over with. The Nightfall expansion was more fun than the original game, fixing issues like dying in water or off cliffs (instead you get teleported back to the ledge). They did not go back and fix this in the main game. The objectives are much more interesting too. 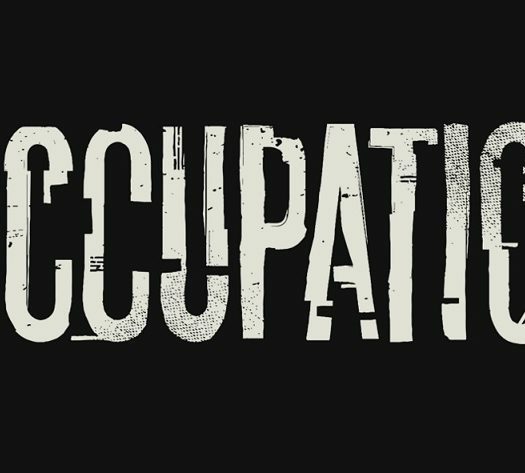 If you really enjoy stealth games, this is a must try! It’s quite basic in the means of sneaking around and assassinating, giving you essentially the same scenarios over and over. Arakami Shadow Edition was developed and published by Lince Works on Xbox One. It was released June 5, 2018, for $24.99. A copy was provided by the publisher for review purposes.